County Helpline 211. They will take down your complaint in writing and forward it to ALL applicable County agencies. Department of Regional Planning - Zoning Enforcement Section. Staff will take down zoning violation complaints at (213) 974-6453, (213) 974-6483 or (213) 974-6455. The Los Angeles County Department of Public works expanded their ‘The Works’ mobile application to include reporting possible property violations. You can now report excessive vegetation, junk or trash; illegal parking; inoperable vehicle; occupied RVs; and improper signs or banners. Users can submit a detailed description of an issue and attach a related site photo. 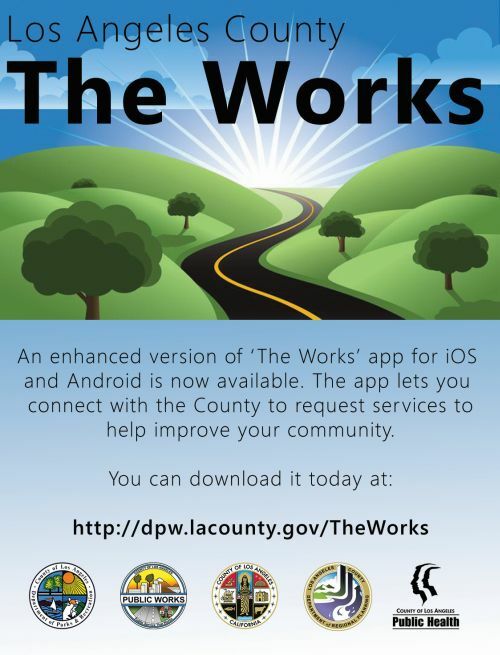 For more information and to download the app, visit: http://dpw.lacounty.gov/theworks/. Click here for the press release. Give your name, address, and telephone number; or remain annonymous. This information is just for us and is kept confidential. Give the exact location of the problem. If no address, location of property, i.e. northwest corner of First and Main streets. Provide additional information that will aid in the investigation. Selling clothes, bags, furniture, paintings, flowers, etc.